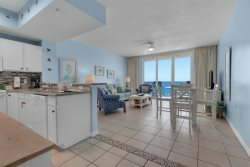 You'll have "Knot-a-Care" in the world when you stay in this recently renovated gulf front 2 bedroom unit at the Summerwind Resort. Take a deep breath and let it all go as you relax on the Emerald green waters of the Navarre Beach Gulf Coast. The perfect rental for a family trip, new bedding and Flat Screen TVs can be found in every room. Spoil your guests, and yourself, with a perfect meal crafted in the upgraded kitchen. Relax on the balcony as you take in the beautiful view from the 11th floor. Or! Head down to the beach to enjoy the complimentary Beach Set up (2 Chairs and one umbrella) that comes with this unit per day. Whatever your vacation plans, "Knot-a-Care" is the perfect rental! This property includes a complimentary Beach Set Up for stays until October 31. The team is always willing to help. They are very friendly! We have never been disappointed! Looking forward to booking next year! Enjoyed every aspect of stay. Staff is always friendly and helpful. The lazy days beach service was exceptional. Unit was wonderful. Very well keep.